The old adage, art reflects life, was never more true than with the rise of the gangster film in the 1930s. Thanks to years of Prohibition, crime, corruption and gangland violence were at an all-time high and this was reflected in the gangster pictures released by Warner Brothers. Though a Hollywood cliche now, guys in fedoras blasting away at each other and men being mowed down by Tommy-guns was very real for the movie goer of the time. Little Caesar Starring Edward G. Robinson and Douglas Fairbanks Jr. - released January 25, 1931. 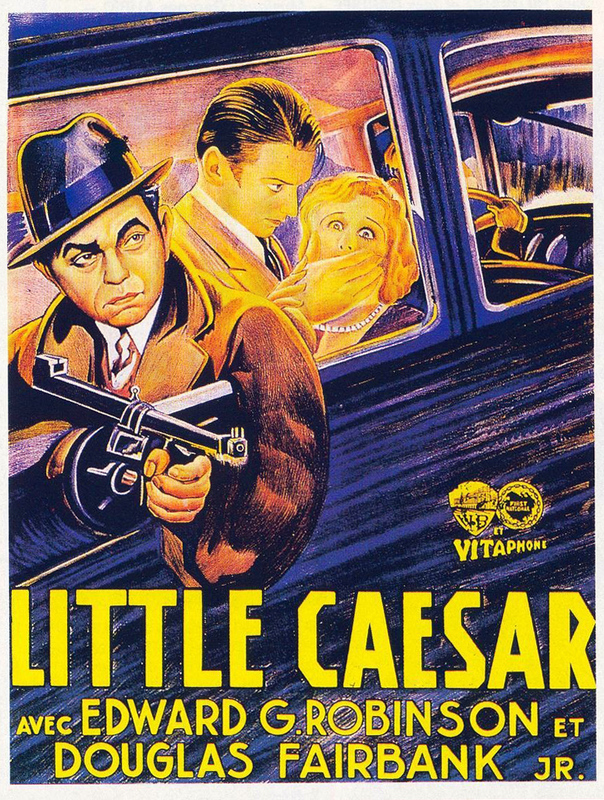 There's not a lot that was ripped from the headlines for Little Caesar but there are a few things that seem familiar to anyone who has immersed him or herself into the gangsters of old. Perhaps it's reaching but, what the hell, it's the movies lets reach. Little Caesar was first a book loosely based on a Chicago hoodlum named Sam Cardinella, who headed a gang of bandits and extortionists during the years just prior to Prohibition. It was written in Chicago, in the late Twenties and so shadows of Al Capone, who was at the height of his career when the book was published and the film released, can also be seen. Robinson plays the title character Caesar Enrico “Rico” Bandetto aka Little Caesar. Rico is a small time hood with big ambitions to move to Chicago and become that City's top gangster. 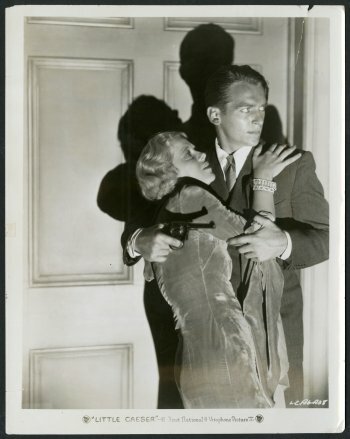 To this end, he and his partner in crime, Joe Massara, played by Fairbanks Jr., move to the Windy City where Rico begins his underworld ascent. First he takes over the small gang from Sam Vettori, next he moves up another notch by displacing Diamond Pete Montana. Along the way he kills Crime Commissioner Alvin McClure. 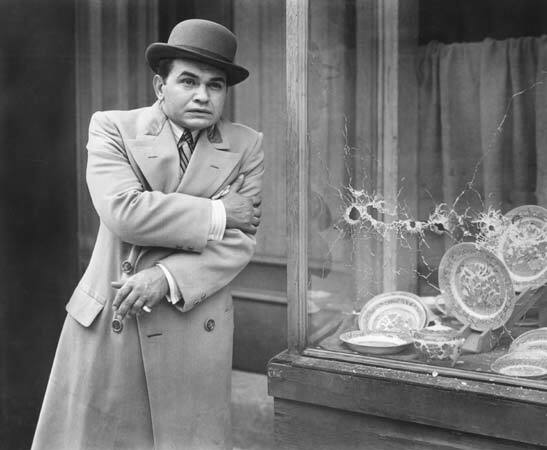 Like the cinematic Rico, Capone was an out-of-towner who showed up in Chicago as a low level hood and had a meteoric rise to the top. 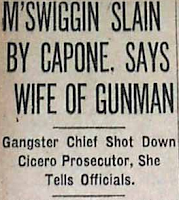 Within five years of his arrival in the Windy City, Capone was running the town’s largest criminal enterprise. Unlike Rico, Capone wasn’t a small town hold-up man, he came from Brooklyn, New York where he was already involved with the Italian underworld. Another incident in the film that mirrors Capone’s career is the murder of the Crime Commissioner Alvin McClure. In the film McClure shows up at a night club and, when he learns that it is owned by gangsters, he starts to leave just as Rico and his gang show up to rob it. The commissioner ends up getting killed by Rico. 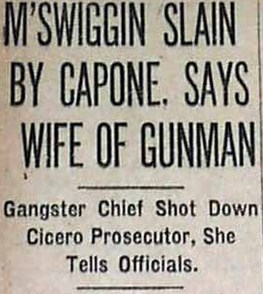 In real life an Assistant District Attorney William McSwiggin was bumped off in Chicago while exiting a tavern with some hoodlum pals and it is believed that Capone was one of the machine gunners who did him in. The stuff movies are made of. Regarding Rico’s pal Joe Massara, it may simply be a coincidence but at the time of the film’s release the most powerful Mafia kingpin in New York was a Capone ally named Joe “the Boss” Masseria. Unlike Massara in the film, Joe the Boss would not have a happy ending. About four months after the release of Little Caesar Masseria was gunned down in a Coney Island restaurant. One of Rico's early bosses is the rich and successful Diamond Pete Montana, Rico at first admires and then surpasses him. 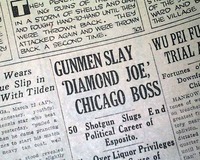 In 1928 wealthy Chicago gangster/politician Diamond Joe Esposito said to have been a Capone nemesis, was bumped off. With the popularity of Little Caesar at the box office, Warner Brothers went into high-gear and mined Chicago and New York's underworlds for box office gold. Have you seen Little Caesar? Did you notice any other scenes or characters that the writers "borrowed" from the underworld?